At approximately 4:30pm on Saturday February 11th, ten year old Clare gave birth to our first lamb of 2006. She is a happy, healthy, darling, (and huge!) girl. 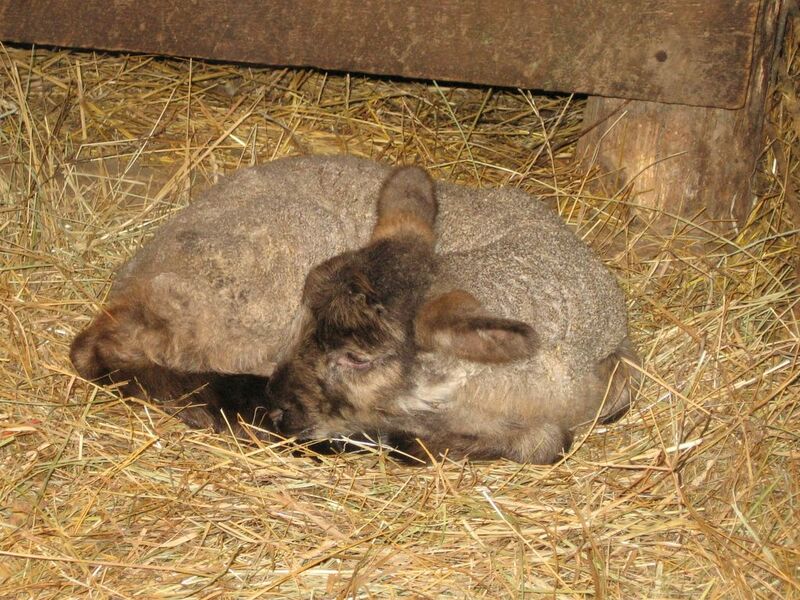 Both mother and baby are doing fine and resting comfortably in their bonding pen. Clare is from my very first crop of lambs. She was born back in 1996 along with Doll Face, Mary, Skinny Chip, and Big Chip. Congratulations also go to big sister And Posh (click here to learn how she came by that interesting name) and to my pal Alisha, who now shares her birthday with a sheep. So what will her name be? I have no idea. We are up to "C" in our alphabet ewe lamb naming plan, but this baby girl can have a name that starts with absolutely any letter. Why? 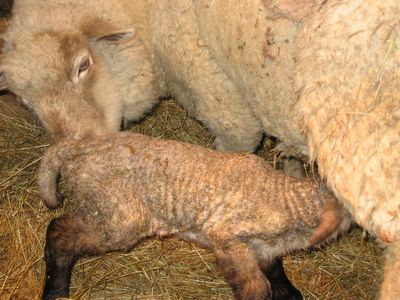 Because this is what I donated to the Menu For Hope back in December: honorary ownership of the first ewe lamb born in 2006. So that means lucky winner Jennifer New and her family are in charge of naming their little woolly prize. Congratulations to Jennifer! (who was emailed first peek photos last evening). We can't wait to find out what you decide to name your new lamb. YAY!!! Such a pretty new girl. Looking forward to more new additions in the weeks to come! I could she possibly be named anything other than "way too cute and adorable to be true" ?? I love visiting your blog. It makes me a little homesick for Missouri at times! A hearty congratulations to you and ewe! She is so cute !!! I am glad she is a girl :) I won't worry about her. OMG she sooo would have made a great "Cashew"! She is beyond cute & adorable! And a heart-felt congrats to Jennifer - how exciting!! If we had one of those I think I'd have to do some fast talking to keep my kids from sleeping in the barn her! Hmmm. I could have sworn Clare looked to be having twins! She shares her birthday with my husband. 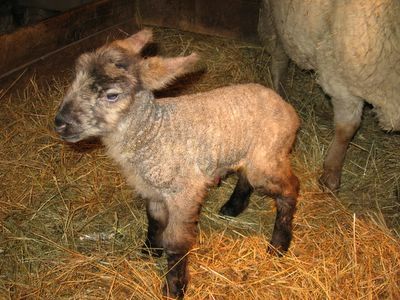 His name is James, so what about Jamie for the little lamb? Happy Birthday to that little baby doll! She totally has the best birthday ever, trust me. Aquarians rock!!! As usual, great photos. And pictures with newborns are alway cute. That is just so darn cute. It must be spring, cuteness is starting to materialize! Um, Susan, I hate to be the one to let the lambkey out of the bag, but that top picture looks very donkey-like. I think Dan and Clare may have been way too frienly last year. Looking on the bright side, Dan's a dad! LOL! Me and my smutty mind. (anyone seen little britan?) anyway..
she is so beautiful FG :) I can't wait to see her grow up!!!! Congratulations! She's a beautiful girl. Good heavens, baby girls are suddenly everywhere! Congratulations! It's hard to believe she's a newborn! Way too mature looking. What a life you have. Congratulations!A very beautiful adorable little girl.You are truly blessed,Susan,to lead such a lovely life in your farm. I sure do miss seeing all the lambs in spring. 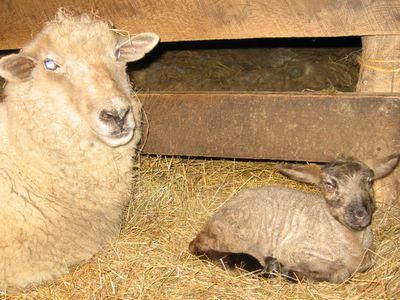 I was born and raised in New Zealand, about 3.5 million people and 80 million sheep. She's adorable, I just want to kiss her!